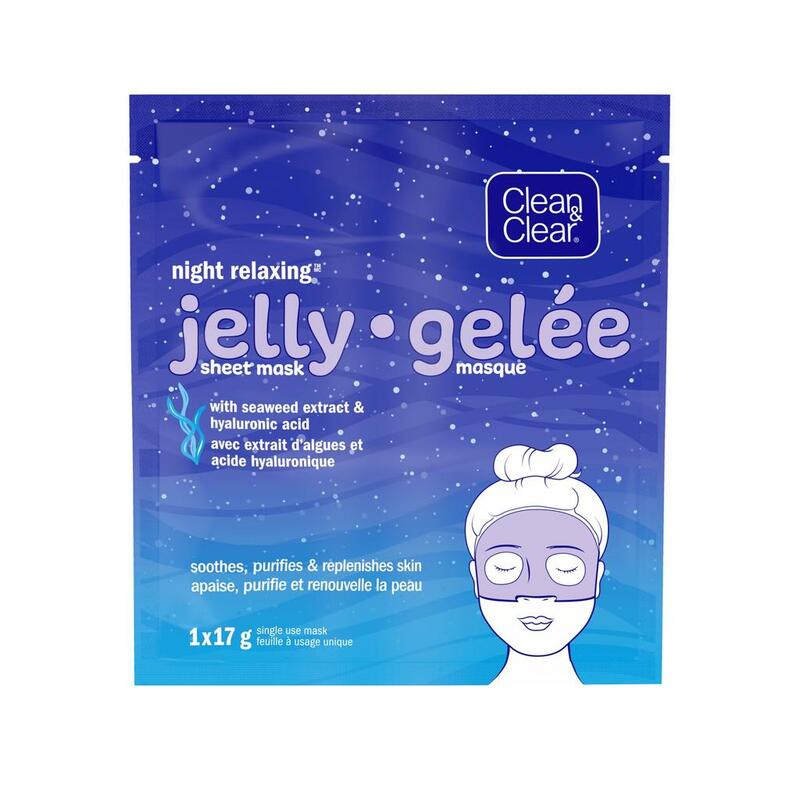 CLEAN & CLEAR NIGHT RELAXING® Jelly Sheet Mask soothes and replenishes skin, targeting the eye area where stress and sleepiness from the day can show. This cooling jelly sheet face mask is designed to contour to skin to help restore and lock in essential nourishing ingredients and moisture. Your skin will be left feeling fresh and replenished. Use this Night Relaxing® jelly sheet mask for just 15 minutes to replenish skin after a long day. INGREDIENTS : Water (eau), Dipropylene Glycol, Propanediol, Ceratonia Siliqua (Carob) Gum, Xanthan Gum, Chondrus Crispus Extract, Phenoxyethanol, Chlorphenesin, PEG-60 Hydrogenated Castor Oil, Potassium Chloride, Parfum, Disodium EDTA, Hydrolyzed Hyaluronic Acid, Tremella Fuciformis Sporocarp Extract, Plukenetia Volubilis Seed Oil, Sucrose Cocoate, Sodium Hyaluronate, Tocopherol, Ext. Violet 2.